Julia Louis-Dreyfus at the 2017 SAG Awards. (CNN) - Julia Louis-Dreyfus sat out Sunday's Screen Actors Guild Awards, but she' still celebrating. Picking up two wins, the "Veep" star became the most decorated actor in the history of the SAG Awards, with nine wins overall. The actress, who is receiving treatment for breast cancer, won the award for best performance by a female actor in a comedy series and will receive a statue as a member of the cast of "Veep," which won for best comedy series ensemble. "I wish I could have been @SAGawards tonight but have to admit it's pretty fun to watch in my pj's," she tweeted. "So honored to win. So proud to be a union member." Congratulating her "Veep" cast, she added, "Miss being at the table with you all. How was the chicken?" 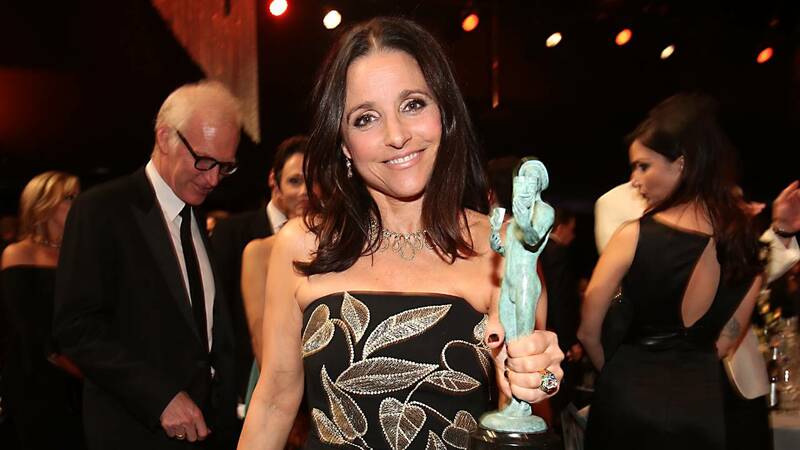 Louis-Dreyfus' previously won five SAG Awards for her work on "Seinfeld," including three as part of the ensemble. Her other four statues were awarded for her work on "Veep." The Screen Actors Guild confirmed Louis-Dreyfus' history-making night in a social media posting. Louis-Dreyfus announced her cancer diagnosis back in September and has periodically updated fans on her progress. She recently completed chemotherapy treatment. Production on the final season of "Veep" is on hold until its star returns. On Sunday, Connie Britton and Mandy Moore accepted Louis-Dreyfus' SAG Award on her behalf. "Julia, we're thinking of you and we love you," Britton said.